A widely sought-after speaker and trainer, he is also the author of numerous well-known software modules including: Parse::RecDescent and Regexp::Grammars (sophisticated parsing tools), Class::Contract (design-by-contract programming in Perl), Lingua::EN::Inflect (rule-based English transformations for text generation), Class::Multimethods (multiple dispatch polymorphism), Text::Autoformat (intelligent automatic reformatting of plaintext), Switch (Perl's missing case statement), NEXT (resumptive method dispatch), Filter::Simple (Perl-based source code manipulation), Quantum::Superpositions (auto-parallelization of serial code using a quantum mechanical metaphor), and Lingua::Romana::Perligata (programming in Latin). All of this software is available free from your local CPAN mirror. 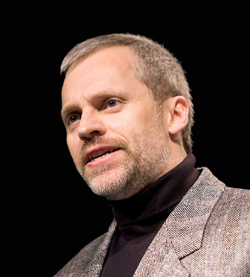 A well-known member of the international Perl community, Damian first came to prominence as the winner of the 1998, 1999, and 2000 Larry Wall Awards for Practical Utility. The best technical paper at the annual Perl Conference was subsequently named in his honour. He has been a member of the technical committee for The Perl Conference and a columnist for former "The Perl Journal". He is a keynote speaker at many Open Source conferences, author of the books "Object Oriented Perl" and "Perl Best Practices", and co-author of "Perl Hacks". In 2001 Damian received the first "Perl Foundation Development Grant" and spent 20 months working on community projects for the betterment of Perl. Between 2001 and 2010 was also an Adjunct Associate Professor with the Faculty of Information Technology, Monash University, Australia. He currently runs an international IT training company – Thoughtstream – that provides programmer training from beginner to masterclass level throughout Europe, North America, and Australasia. Much of his time over the past decade has been spent working with Larry Wall on the design of the new Perl 6 programming language and producing explanatory documents and presentations exploring Larry's design decisions.